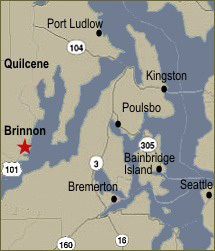 Serving the Hood Canal region including the waterfront communities of Brinnon and Quilcene. Our office is conveniently located on Highway 101 in Brinnon, Washington. Stop by for real estate information and maps, or give us a call. Our full-time sales associates are ready to share their working experience and their knowledge of the Olympic Peninsula with you. As the leading Real Estate brokerage on Hood Canal, our clients have come to expect excellence in every transaction. Through dedication, research, and detailed analysis of market conditions, we empower our clients to make the best-informed decisions for their personal needs.